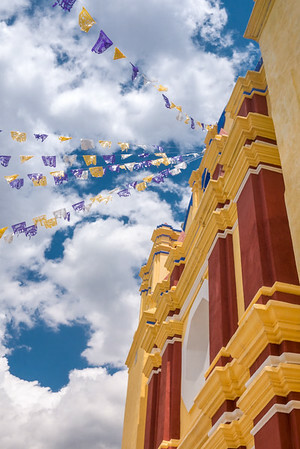 One of the most culturally rich places in Mexico, Oaxaca is a beautiful place to visit. This region, and the city in particular, is widely known for it’s mezcal, chocolate, and mole; as well as the diverse indigenous groups still calling the Oaxaca Valley home after hundreds of years. While I love traveling the Yucatán for its intriguing Maya ruins and uniquely beautiful cenotes, Oaxaca provides a marrying of food, culture, and history that is unique to this region in Mexico. 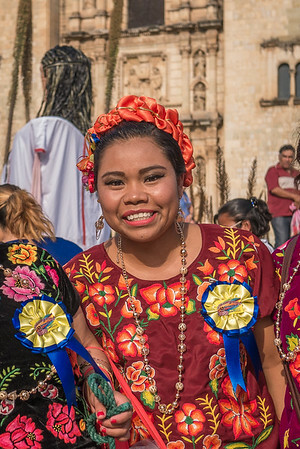 And while tourists descend on Oaxaca (pronounced wa-HAH-kah) for the two most notable festivals, Guelaguetza and Day of the Dead, it’s vibrant and interesting year-round. The city has beautifully restored colonial buildings—many of which are now hotels, museums and restaurants. In the past couple of years, international travel magazines have featured the city’s chefs for their intriguing twists on classic dishes that have long shaped the history of Mexico’s food scene. Couple that with this being the birthplace of mezcal—a smoky, fiery liquor that has quickly risen as the drink of choice in hipster havens from San Francisco to London—and you will never lack for things to do when you visit. Jump to the part of the guide you need, or start from the top and work your way through the information and recommendations for visiting Oaxaca, Mexico. During the pre-colonial period, Oaxaca was home to roughly 16 different cultures; each one had its own language, customs, and traditions. The Zapotecs and Mixtecas were the largest and most sophisticated of these, and this ratio holds true today as descendants are widely spread throughout the valley in small villages and farms. Between 1500-500 B.C., San José Magote, a Zapotecan city, was the largest settlement in what is now known as the state of Oaxaca. Thought to be the oldest agricultural city, San José Magote was one of the first settlements in the Oaxaca Valley to use pottery — a tradition that is carried on today and you’ll see examples of it on your wanders. During the pre-colonial period, Oaxaca was home to roughly 16 different cultures; each one had its own language, customs, and traditions. The Zapotecs and Mixtecas were the largest and most sophisticated of these, and this ratio holds true today as descendants are widely spread throughout the valley in villages and farms. 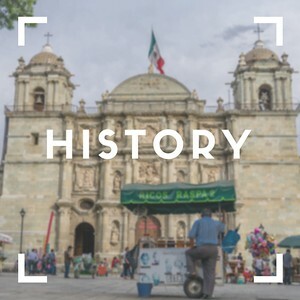 In the 15th century, the Aztecs (who lived in around what we now call Mexico City) made their way to Oaxaca, conquered local tribes, and took control of the valley. Their reign was short. In 1519, Spanish conquistador Hernán Cortés marched into central Mexico and the Oaxaca Valley. By 1521, mass killings done in the name of Cortés had nearly wiped out the Aztec empire. 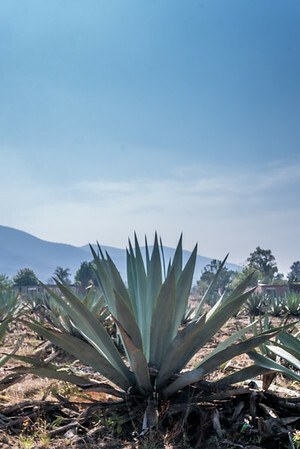 Many Spanish people stayed behind and worked in rich Spanish estates—you’ll find these gorgeous haciendas around the Oaxaca Valley now, with many operating as agave plantations cultivating mezcal. By 1529, things were going well for Cortés and the Spanish decreed that he was ‘Marqués del Valle de Oaxaca—now known as Oaxaca City. 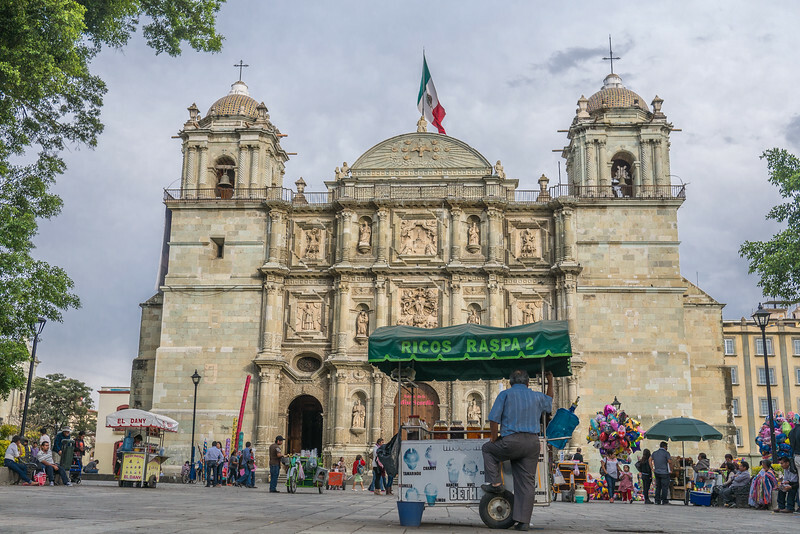 For this reason, you’ll find Oaxaca is laid out similar to traditional colonial towns, with a zócalo surrounded by the main cathedral and government buildings. During the 300 years of colonial rule, the Spanish Europeanized Mexico, including Oaxaca. And while they built schools and churches for the indigenous people, the power and wealth of the valley remained in the hands of the Spanish and the clergy. Then, things changed again, and during the battle of Huajuapan in 1811, Valerio Trujano’s guerilla fighters won control of Oaxaca for the revolutionaries. Free of the Spanish, Oaxaca floundered until almost a hundred years later, in 1910. The people of Oaxaca followed Emiliano Zapata, who claimed the land belonged to the workers, not the rich landowners; it was the Mexican Revolution. Today, Oaxaca remains one of Mexico’s poorer and underdeveloped states. 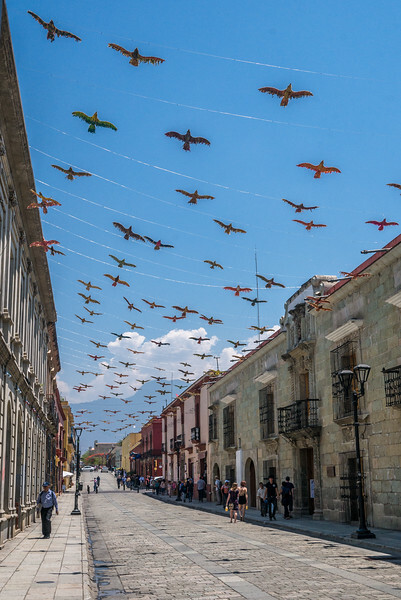 That said, Oaxaca (both city and state) is one of the more popular tourist destinations in central Mexico because of its rich native culture and regional foods rooted in the history of its people. Water: Not safe. Drink bottled, or consider the merits of a SteriPen or LifeStraw for your trip. I used the tap water to brush my teeth, but other expats do not. If you’re a new traveler, or you have a sensitive stomach, use bottled water even for teeth brushing. Weather: The winters in Oaxaca are mild, cool, and exceedingly dry. You won’t see snow in the city, but night-time temperatures can drop drastically, even on what was a seemingly mild winter day. By mid summer, it’s scorching hot and unrelentingly sunny—bring a hat and sunscreen. Stay well-hydrated year round. Visas: Visas for Americans—and most travelers—is pretty easy. Americans get a quick stamp in their passport valid for six months. Other nationalities can check the visa requirements here. Local SIM: This is a cinch and highly recommended for GPS and navigating. Telcel is likely your best option, although Movistar is popular in this region of Mexico (but not other regions). For most travelers to Oaxaca, and especially those traveling to other areas of Mexico, opt for Telcel. If you have a U.S. T-Mobile account, it will do the trick, too. Full SIM guide here—note that you must show your passport to buy one at some locations (it’s hit or miss which places will ask to see it before selling you a SIM). Budget: Oaxaca is a favored destination for North American retirees because it’s so easy on the wallet. Extended-stay accommodation for the winter months books up early, but you can find affordable hostels and guesthouses year round. A budget backpacker can get by with $25/day on the frugal side, and mid-range travelers will have plenty of tasty food and cute guesthouses to enjoy on a budget closer to $45/day per person. Long-term, it’s well under $700 a month to live in Oaxaca City. Festivals of Note: Day of the Dead is the signature festival in this region of Mexico and Oaxaca is an ideal place to celebrate. Day of the Dead occurs around Halloween, specifically in the first days of November. Guelaguetza is huge and celebrates the 16 indigenous cultures of the Oaxaca Valley (July). And on an off-beat note, The Fiesta de Rábanos, the Festival of the Radishes is lively and takes place in the zócalo around the Christmas holidays with fireworks and crafts (23 December). Possible Issues: Not many. If you’re prone to nosebleeds, then the dry winters might exacerbate the issue. And since Oaxaca is at altitude, those coming from sea-level may experience a few days of headaches and tiredness that can come from altitude sickness if you are not acclimated. Stay well hydrated and get a good night’s sleep. Safety: Although a few regions of Mexico have cartel violence and safety concerns, Oaxaca State is mostly free from these threats. You may, however, encounter issues with the local protests—Oaxaca is famous for the amount of protests and these protesters are usually nonviolent, but they do close down the roads for entire days. The protests ramp up every year around May. Many times, these take place outside of the tourist areas, but occasionally the protest focuses on the city-center’s zòcolo. By and large, tourists shouldn’t fear the protesting activity as it is most often teachers protesting wages, villages protesting new laws, and things of that sort. Again, it’s not targeted toward tourists and the tour companies and people of Oaxaca will be grateful to see you no matter what types of local protests are occurring at the time. But, you should double-check local information before traveling there in spring/summer. In terms of personal safety walking around town, you should have no issues walking the city center after dark, it’s lively and active until midnight; and later on the weekends. Cabs are always nearby too, if you need a quick lift home. No matter what time of day, be cautious of petty theft and opportunistic crimes like bag and phone snatching by a motorbike zooming past—it’s not common, but nor is it unheard of. There have been problems with muggings for solitary hikers near the Cerro del Fortin auditorium. Check the U.S. government’s travel warnings to keep abreast of that situation, but mostly don’t be up there after sunset, or alone with expensive gear. Internet Situation: Wi-Fi is rampant and available at guesthouses and cafes. The data plans are also solid inside of cities and tourist areas so you can tether to your phone if you buy a data plan. Food Considerations: Food standards are good in this region of Mexico, and Oaxaca is famous for its culinary traditions and history. This is the “Land of the Seven Moles,” and they take their food (and their pork in particular) seriously. The water is not safe to drink, but bottled water is easy to find. Street food is scattered around, but the markets hold most of the street eats, so check the guides below to known where you can find the affordable and tasty street eats. Outside of the markets, you can most often find steamed corn (elotes and esquites), burgers, and sometimes a taco stand. If you decide to stick to budget and street food options, follow these food safety principles. 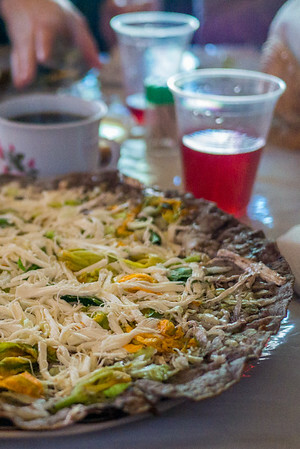 If you’re vegetarian, Oaxaca is a hard place to eat. Because of that, I dedicated a section below to eating vegetarian in this region of Mexico specifically. Drink: Mezcal is the drink of choice in Oaxaca and you don’t have to go far to try it. It’s a very strong and smoky liquor, like tequila with a very distinct flavor. I don’t care for mezcal in any fashion (and there are many types and flavors to try), but I was in the minority, by far. In my group of friends, I alone didn’t enjoy the drink. That said, I did enjoy learning about the history of the drink and understanding the importance of the agave plants to the local populations. I recommend mezcal tours in the city guides below; I highly recommended that you sign up for one. Accommodation: This is a cinch. I use a Lonely Planet when I am moving around rapidly, backpacker style. If you’re basing yourself out of one of the major cities, consider using one of the booking engines. While the city guides below go to a hotel booking site, many are also found on Airbnb if you are member. (A Little Adrift readers get an Airbnb discount on their first stay.) This website has a very established presence in this region of Mexico because of the number of North American snowbirds visiting each winter—Airbnb is among the easiest ways to book nice spots in a good area of town. For backpackers and families should consider Booking.com (ALA readers receive a discount on their first booking!). And if you buy a local SIM (which you should), you can easily call ahead and directly reserve spots en route. The months of December through February are very busy in Oaxaca City—if you plan any sort of extended stay, book ahead or you will not find affordable apartments and accommodations for rent. If none of these will do, check out my detailed guide to finding good places to stay. Transportation: The major roads are well maintained and connect most any place you’ll need to go, but this is a mountainous region of Mexico and there is no way to avoid the winding roads. If you are prone to motion sickness, the long bus rides will tax your ability to stay well. For shorter rides, colectivos, shared taxis, are an easy way to visit any of the rural towns. These taxis congregate at Abastos market (also called “central” when you/drivers are returning to the city), and a few other spots around town. The northeastern colectivo launching point that I reference in the recommended daytrips is pinpointed here—it’s easy to find because of the nearby McDonald’s. Go to this spot, then find a shared taxi with the name of your destination painted on the side. The colectivos usually cost 10-25 pesos max to any towns out in the Valley, and they add people to the car as you drive in the direction of your destination. Of note, the local buses are considerably safer than colectivos, but less convenient. If you have Spanish and time on your side, these buses ply the main highways out of town. You will have to know your stop by sight or beg help from locals. You can catch a bus to the day-trip spots from the same spot where you catch a colectivo. In Oaxaca City, the taxis are a flat fee; they are convenient if you find yourself out late and not prepared to navigate the cobbled streets on the way home. That said, most of Oaxaca City is walkable and you can explore everything in the city on foot. Getting out of Oaxaca, the Ado bus network is extensive and ideal for those on a budget. These buses are large, comfortable, and affordable. Rental cars are easy to come by, although expensive to rent—they tack huge fees and taxes onto the offered price (read this thorough piece on navigating rental insurance in Mexico). World Travel Planning Tips + Resources: From the best travel gear to how to pick travel insurance—a detailed list of resources, tips, and advice to help you plan an amazing trip. If you’re heading elsewhere in Mexico, check out my Yucatán Peninsula Travel Guide! My key advice for vegetarians visiting Oaxaca, Mexico is to bring patience and diligence. Ask specific questions about your food—especially street food—and look out for lard and meat broths in sauces and corn-based dishes. While there are street foods you can eat, use the recommended restaurants and dishes as your starting point. Although known as a mega foodie destination, Oaxaca, Mexico is not a great spot for vegetarians; the food culture here is heavy on the pork. By the end of my time living in Oaxaca, I ended up cooking at home most days, or dining almost exclusively at the handful of vegan and vegetarian specific spots. Since I usually love eating street food while I travel, this was a change of pace. 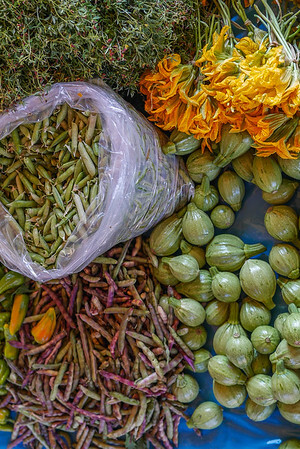 Being prepared is the best way to tackle Oaxaca’s food scene. Carry your own nuts, fruits, etc for emergencies. Save the vegetarian spots on your Google Maps. Learn how to order your food vegetarian in Spanish. As a vegetarian, there are a lot of caveats to the food scene and it really does help if you speak Spanish before you eat street food. Without Spanish, there’s little chance that you are guaranteed vegetarian street eats, or even restaurant eats if you are outside of the city center. Servers at the restaurants in the city center usually speak English and will often understand a request for vegetarian food. At the nicer restaurants, they will always understand it. These places are pricier, however, so it’s a budget saver (and tastier) if you can eat at least one meal a day on the streets. At street stalls, vegetarianism is not understood. They understand the word vegetariano, but every aspect of what that entails is simply not a part of the local culture. Oaxaca’s indigenous and long-running food culture is deeply entrenched; culturally, vegetarianism is just not understood. There are two main things you’ll find in your food: pork lard and chicken stock. Let’s talk about pork lard. It’s called both asiento and manteca de cerdo. It’s in everything. This is the largest obstacle to eating vegetarian in Oaxaca; the pork lard is a base for many of the foods most notable in this region. They use pork lard on the tlayudas and the mamelas. All seven types of mole, the signature sauce, have either lard, chicken stock, or both. You can be 100% certain that if you are not a vegetarian restaurant that the mole sauce (pronounced MOE-lay) is not vegetarian. Here are a few other considerations when eating specific types of food. The easiest street food that is almost always safe for vegetarians is the quesadilla with flor de calabaza (squash blossom flower). But to eat even a quesadilla, you need wiggle room in your food standards. 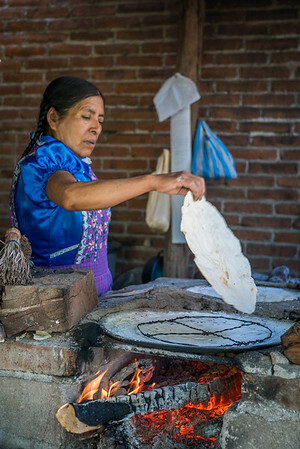 Your quesadilla will share a cooking surface, called a comal here, with the meat and lard-filled foods. These surfaces are incredibly hot, so any food on the surface burns off quickly, but they will not take care to avoid contamination. And although things like the mamelas and tyludas can be made without the lard, which is usually the first layer, the black beans at all street stalls are cross-contaminated with the lard. It’s these little nuances that make it hard for many vegetarians to enjoy the street food culture. It’s possible, but you have to be aware, patient, and kind when they don’t understand. The idea of avoiding lard is just not understood, it’s the base of all of their foods here. If you’re a flexitarian, then you might look past the trace contamination—they will execute your request to the best they understand, but not always to the degree that a strict vegetarian or vegan might require. One street food snack that is always safe is elotes or esquites. This is a corn snack served out of metal carts that park near the zòcalo each evening. One is served on the cob, the other is corn shaved into a cup. All of the carts will serve you either. Both types are served with mayonnaise, cheese, lime, and chili—it’s delicious and I prefer mine in the cup as the cob is incredibly messy. Those are the survival tips for eating outside of the vegetarian restaurants. Let’s look at the vegetarian, and the vegetarian-friendly (they have at least one interesting veggie dish on the menu) restaurants in the city. For restaurant foods, there are more options. Most restaurants serve Guacamole and it’s a great snack—I tried the guacs all over town. 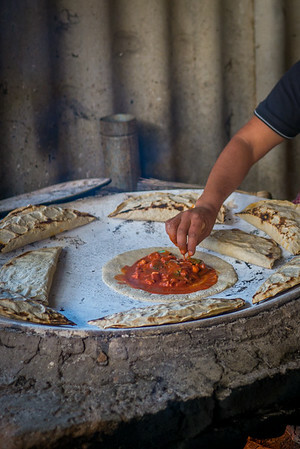 Most comedores and cantinas, or rather hole-in-the-wall restaurants will fix you an omelet no matter the time of day; these small restaurants can also prepare a cheese quesadilla with the famous Oaxaca string cheese called quesillo. Beans and rice is a flexitarian dish as there is often pork lard in the beans, and anything but white rice is likely cooked with chicken stock. There is a weekly organic market called Pochote and a woman there sells veg mole, but the protests muddled things up and it was disbanded. It’s back in the city during high season but the location changes, as do the vendors, so ask your guesthouse for the latest location. Calabacitas Tiernas; Porfirio Díaz 1105. Also called La Jicara for the book shop that shares the premises. Offers a vegan menu alongside vegetarian ones and the menu changes often. While once only vegetarian, they added in a few meat options. Very tasty food and the dishes are more interesting than you find in many places. It gets busy at dinner, so go for lunch or before the dinner rush. Viajero Cafe Arte, Berriozabal 118. The owners are committed to tasty, clean food and the dishes are interesting and creatively presented. It has Wi-Fi and it’s a good place to work from if you need it. You can also ask the owners about any new vegetarian restaurants in town; they know the food scene very well! Cafetería Xiguela, Hidalgo 202, Barrio Jalatlaco. This both a healthfood store and restaurant combo with a commitment to healthy, local food. Chilhuacle Rojo. García Vigil 304. They have a vegan coloradito mole, which is tasty and hard to find. Has an organic farm-to-table premise and a range of options. Los Danzantes and Catedral. Macedonio Acalá 403 and García Vigil 105, respectively. These are both fancier restaurants in town. If you’re in a mixed group and want somewhere up-scale, I enjoyed the vegetarian options here, although you’re looking at soup or pasta as your mains, not Mexican fare. (There are a paucity of filling options at Casa Oaxaca, a spot highly rated but not remotely veg-friendly). Head to Happy Cow Oaxaca for a more extensive list. And do a search for Indian restaurants once you’re there—there were two at last count and they are tasty. When ordering your food at smaller non-veg restaurants, always confirm. Be the politely persistent person ensuring your server understands you. Even if the menu is in perfect English, don’t count on every ingredient being listed. I ordered a croissant drizzled in honey and walnuts at Cafe Nuevo Mundo (which has great coffee by the way), and the croissant came out with sliced ham (?!). To successfully eat vegetarian, you need preparation and patience. Clarify every ingredient and don’t assume that if you had it before that it’s made the same way somewhere else. La Casa de los Secretos: Only available in Spanish, it’s also the only novel I could find set in Oaxaca and sharing the culture and history unique to this area. You should definitely read it before visiting if you can read Spanish. Mexico: Biography of Power: For the history buff, it doesn’t get much better than this comprehensive look at how the centralization of power throughout Mexico’s history has shaped not only the country, but all of Latin America. The Death Of Artemio Cruz: Hailed as a masterpiece and a”haunting voyage into the soul of modern Mexico,” this novel uses the narrator’s flashbacks to process how the country’s past continues to affect the present. Sliced Iguana: Travels in Mexico: On my list for a while now and recommended by readers as an easy read that gives a light touch to all the history and culture she talks about while retelling her journey. The People’s Guide to Mexico: Even veteran Mexico travelers will enjoy this book. It’s like a guidebook, but even more. It’s hands-down the best guidebook you should use to understand the various regions, the cultural quirks, and all the reasons Mexico is a fantastic place to travel and live. Unlike the Lonely Planet recommended above, this one is a cultural guide to the country. It comes highly recommended by me, and by heaps of Amazon reviewers too. Frida at Home: A beautiful and well-researched book on Frida Kahlo, one of Mexico’s well known artists and a national icon. From her early life to her painting and marriage to Diego Rivera, give one a peek into how Mexican culture and landscapes shaped this magnificant woman. The Rise of Mezcal: Great for Cocktails, Better for Oaxaca: Mezcal is the favored drink in Oaxaca State, and it’s making waves all over the world too. This is a great read on the history of mezcal and a necessary reading before signing up for your own mezcal tour to a nearby palenque. Mexico: History and Resistance: A solid podcast that makes listening to the country’s history easy. Download this and prep for your Mexico trip by taking a trip through time. Mexico with kids: Good niche read with a lot of facts and information you might be wondering about family specific travel. Recommended Guidebook: The Lonely Planet Mexico is frequently updated, so it’s the best option. I always carry a paper guidebook so that I can easily read the history of each site while I am there. The Lonely Planet guides also have the best transportation sections, which are necessary if you are backpacking the region. I also have a travel guide to the Yucatan Peninsula and Guatemala for those heading that way. Also, if you want Mexico inspiration once you return home, this Mexico Food Map is a gorgeous way to keep the Mexico memories alive. Read all my Mexico travel stories and find more regional fiction and nonfiction books and long-reads. Socially responsible travel in Mexico is easier than in some parts of the world. The dark side of animal tourism haunts many travelers in Southeast Asia. But in Mexico, responsible tourism focuses more on people than animals (excluding the diving done along the coast!). 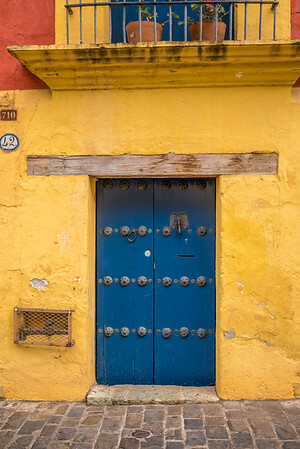 Oaxaca is the heart of indigenous Mexico and Oaxaca State has a large concentration of the indigenous cultures—16 different groups with unique customs and languages date back hundreds of years. 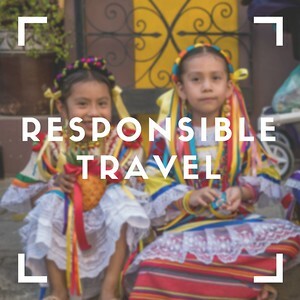 There are general tactics for responsible travel anywhere in the world, and those linked tips allow you to lessen your impact on the places you visit. For Oaxaca specifically, let’s look at the regional activities and treks, as well as how to find responsible volunteering opportunities. Oaxaca State is a mountainous region encompassed within the Sierra Madre de Oaxaca. This unique location makes it the ideal place to plan nature hikes and remote homestays within the indigenous communities. In fact, community-based tourism (CBT) is the number one way to responsibly visit the mountains outside of Oaxaca, as well as the local indigenous cultures. Many of the cabañas are well-appointed too. Some are rustic, but others offer many creature comforts you wouldn’t expect to find in such rural areas. These communities have invested a lot of money and resources in making their cabañas and towns hospitable to tourism. That said, there is painfully little advice on how to arrange a trek or a weekend at one of the cabañas. For formal trekking tours, where you go on a proper adventure with guides, Expediciones Sierra Norte is the best company. Not only are their tours great, but they have sound responsible tourism practices. They have offices in Oaxaca Centro if you want a face-to-face before booking something. For indie travelers with a bit of Spanish and a sense of adventure, you can book directly with the cabañas located in towns all over the region. Oaxaca Mio offers the best information on each site, what they offer, and contact information. That fantastic map on the right is from its website and it’s the only one like it that I’ve ever found. Oaxaca Mio provides information on programs in all the tiny towns, like San Miguel del Valle, which is an uber traditional town where I spent many of my volunteers hours. You can also find information on the nearby Pueblos Magicos, which are cultural heritage towns singled out by the government as special. The green area on the map, Pueblos Mancomunados, is particularly popular with birders and nature lovers. 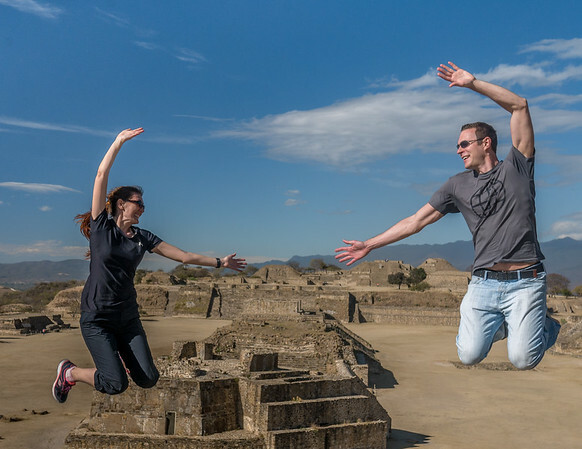 Oaxaca has a range of opportunities for travelers keen to volunteer in the region. Most of the volunteer opportunities require at least a few weeks commitment from volunteers to ensure greatest impact. That said, there are opportunities for short-term projects if you have specialized skills such as any sort of medical or healthcare background, or a background in construction and building-type work. The indigenous communities outside of Oaxaca often lack access to strong healthcare. For that reason, doctors in any field (medical, dental, ophthalmology, physical therapy, etc) are particularly useful, even in short clinics. If you’re a medical volunteer heading to Oaxaca, you can certainly find an outlet for your skills and knowledge. There are many large NGOs offering paid programs, but you can easily find indie opportunities that only require you to cover your own room and board for this type of travel. Consider this list of vetted independent volunteer opportunities in Mexico—there are extensive options in Oaxaca State. 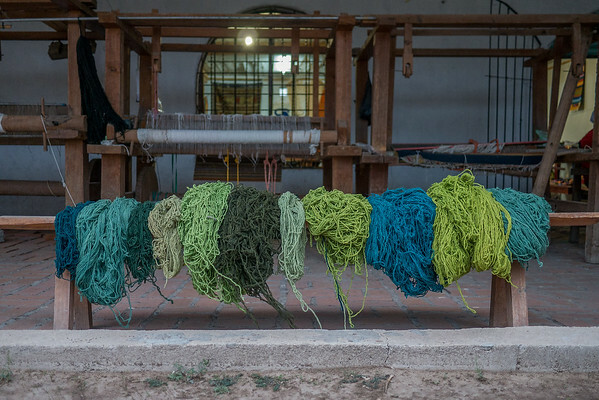 Consider using and visiting these Mexican social enterprises on your trip. Supporting social enterprises is one of the easiest ways to create a trip with positive impact. This means picking businesses that are using funds to support local communities and to offer training, support, or to protect natural resources. You can do everything from shop for souvenirs to learning how to make pure chocolate to picking a trekking guide to finding a homestay—all with companies committed to social impact and respect. Oaxaca State is a popular tourist region in Mexico. 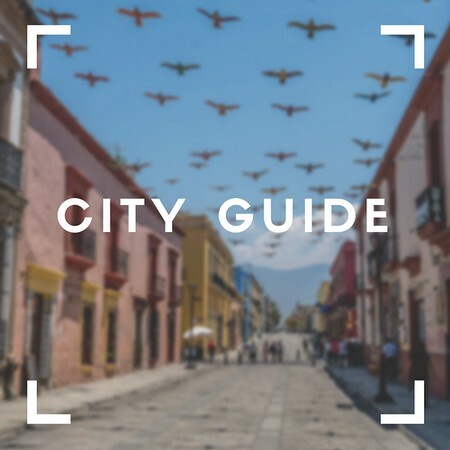 The following guide covers everything to do in Oaxaca City, and as day or weekend trips into the surrounding mountains and ecotourism hotspots. If you head to the coast, use this thorough Travel Guide to Puerto Escondido. Volunteering with En Vía and learning more about the region’s indigenous cultures and how microfinance is helping them better their lives. Visiting the Zapotec cities and villages east of Ocoaaxaca, like Teotitlán and others. Hanging out with friends in Oaxaca City’s zócalo in the evenings and soaking in the music, laughter, and happiness. 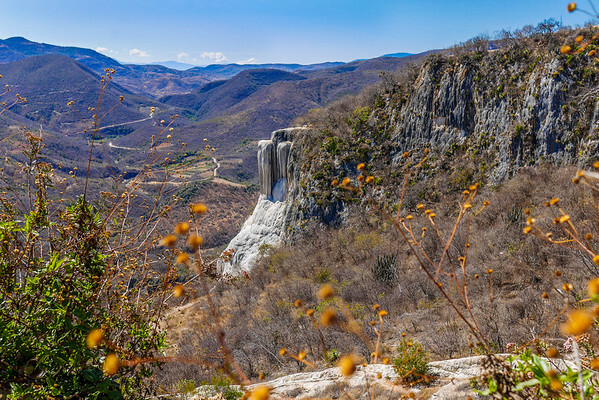 Visiting the stunning frozen waterfalls at Hierve el Agua outside of Oaxaca. 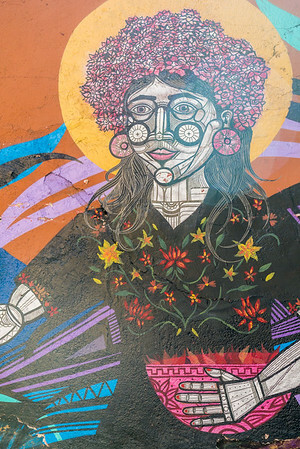 Taking photo walks during the golden hour before sunset to capture the gorgeous churches and lively street scenes and colorful graffiti around the city. If you’ve read this far into this guide, I don’t have to convince you that Oaxaca is beautiful with a lot to offer. If you have a few days in the city, you’ll definitely want to split your time in the city and in the valley doing one of the day trips I recommend. Many of the more gorgeous sites and communities are just a short ride outside of the city. I stayed in Oaxaca for nearly six months, so although you probably can’t hit all of these day trips and tours recommended unless you have a couple of weeks. In addition to the traditional things to do, use Que Pasa Oaxaca‘s event’s guide to see the upcoming shows, lectures, arts performances, etc (the calendar is glitchy, but it does have the best list of events in the city). Hang out in the zócolo. Nearly every Mexican town has a zócolo, which signifies a park or plaza at the center of town. When the Spanish colonized Mexico, these zócolos became the central meeting spot in town and often feature a gorgeous cathedral as well. Oaxaca’s zócolo teems with activity at any time of day and it’s beautiful and shady — one of the prettier ones I’ve seen. This is an easy place for a meal if you speak no Spanish (restaurants line the sides), and in the evenings you can find a few street food carts offering fried plantains, corn, and the perennially favorite of hot dogs. Sometimes you’ll spot dances, wedding receptions, or a host of other activities throughout the day and night. It’s fun and you should make a point to visit multiple times. Visit the churches. Three main churches in town are worth a visit. The Cathedral of Our Lady of the Assumption in the zócalo is gorgeous and be sure to pay attention to the engraved glass windows inside. 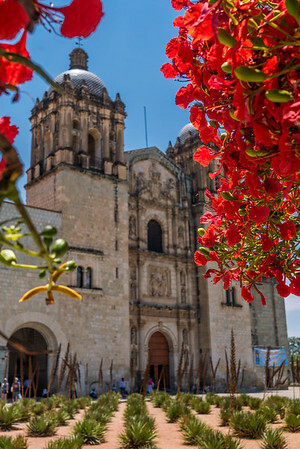 The Church of Santo Domingo de Guzmán is just a few blocks from the cathedral and you really will want to ensure you’re there during visiting hours to glimpse the gilded interior — it’s much fancier than most Mexican churches! And on your wanders, bookmark the The Basilica of Our Lady of Solitude to round out your visit to the city’s important churches. This is dedicated to the patron saint of Oaxaca and is notable for the gorgeous carvings and unique green cantera stone. Learn Spanish. Spanish lessons are cheap in Oaxaca. I paid 250 pesos for a two-hour private lesson once a week (about 12 dollars). There are even cheaper options, and more expensive, too. I loved my teacher Letty and I can connect ALA readers to her, just shoot me an email if you need her information. If you want intensive language lessons — several hours a day, every day — it’s likely best to find a small group class (or private lessons). Unless it’s off-season, Letty will likely have daily lessons with other students, so you’ll need to contact a Spanish school in the city. Consider ICO or Oaxaca International. This page also provides a full list of Spanish schools in the city. Take an En Vía tour. I volunteered with Fundación En Vía and came to deeply respect its tourism model and how it supports microfinance projects in the valley east of Oaxaca. The En Vía tours are affordable and take half a day. You’ll visit four to five of the women in the microfinance program and learn about their lives and how they use micro-loans to better their lives and the lives of their families. One hundred percent of the tour fees go directly into the microlending program 2.5 times (once the money’s been lent and paid back twice, the third time half is used to fund the five full-time employees, and the other half remains in the loan pool). These tours are the single best way to learn about the indigenous cultures in this region of Mexico. Take a mezcal tour into the valley. Alvin runs educational mezcal tours in the region; these are small and less frequent than some, but you he offers fluent English, small groups, and a passion for the topic. Read Alvin’s story in this great piece. Learn how to make chocolate. The CACAO Cooperative is a very small social enterprise still growing its business. For that reason, you’ll need to schedule a workshop through email and bring a couple of friends as it will likely be a private class just with your group. The class is in Huayapam, which is an easy taxi or bus ride from the center. It’s a fascinating process and you’ll prepare chocolate from scratch, roasting cacao beans, grinding, sweetening, and then shaping the chocolate. A great way for chocolate lovers to learn the history of how cacao has shaped Oaxaca’s history. The fair-trade mezcal offered for sale is also a fantastic souvenir. Only one of the partners speaks conversational English, so confirm that you need the workshop in English if you don’t speak Spanish. Take a cooking class. While there are many options in town, El Sabor Zapotec is run by Reyna Mendoza, one of the women in the En Vía microfinance program, and it’s well done. 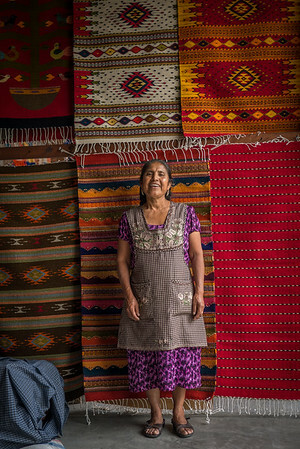 Tours offer transport out to Teotitlán, where she lives and where she has a beautiful kitchen. 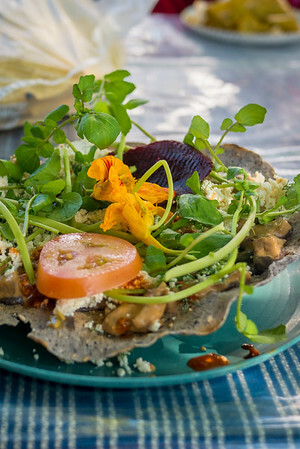 If you eat meat, there are people better suited to helping you suss out the local food scene—start here for a look at the exciting things happening in Oaxaca’s Mexican fusion food scene. 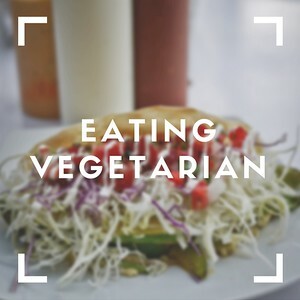 If you missed it, I outline how to eat vegetarian in Oaxaca above. Eat at the Mercado 20 de Noviembre. Just a couple of blocks south of the zócolo, this large market is the best place in town for cheap eats. Plan on eating dinner here and you’ll find tlayudas, tacos, and plenty of mole dishes. 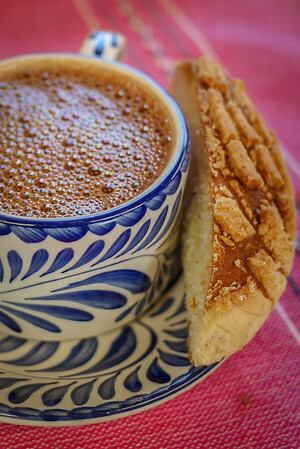 Vendors also sell chocolate and bread—a staple drink/dessert and this is a good spot to try that too. There is a hall of meats in the market too, and stalls of spices, baskets of chilis, and loads of dry goods—it makes for an interesting wander even when not hungry. Hunt down vegetarian food. Use the dedicated subsection above to taste the flavors of Oaxaca as a vegetarian. And all the fancy fusion restaurants have at least one vegetarian item on the menu. Go to a fancy fusion restaurant. Oaxaca is a good place to splurge because you can have a beautiful dining experience for a quarter the price of back home. The city is gaining a global reputation for the innovations chefs are making with the traditional flavors and signature Oaxaca dishes. I recommend Los Danzantes or Catedral as the most vegetarian-friendly upscale restaurants. Casa Oaxaca is not a good bet for vegetarians, and I did not eat at Pitiona so I can’t weigh in there. Grab coffee. If you need a quick coffee, pop into one of the town’s Café Brújulas—they serve a very nice coffee and the berry muffins are rad. My favorite tiny spot is Alma de Cafe (Margarita Maza de Juárez 211-A)—the sisters who run it are so sweet and they have gorgeous salads alongside fresh-baked muffins and cookies. Drink Mezcal. You can find mezcal on most any menu in town, but it’s best enjoyed with friends in one of the city’s laid-back bars and roof-top spots. Mezcalarita is one good option (Macedonio Alcalá 706). Mezcalogía is perennially popular (García Vigil 509). And if you’re really into the drink, this list is better than many I’ve seen online. Midrange: La Betulia is a cute B&B is run by the owners of En Vía, the social enterprise I volunteered with while I lived in Oaxaca. It was beautifully renovated and makes a nice, central spot from which to wander the city. Also beautiful is the family-run El Diablo y La Sandia, where the little touches and friendly service make the place unique in a city of many accommodation options. Budget: Casa Angel Hostel is hands-down the best hostel option in town. I visited a friend staying here in a private room and it looked great — clean, spacious, and newly updated. There is a full kitchen and free Wi-Fi and there was always a good backpacker vibe in the common room. Book on Booking.com for the best rates. Upscale. If you’ve got some cash or a special occasion, there are two spots to consider. Hotel La Casona de Tita is quiet and well-appointed with homey comforts and breakfast features homemade jams. Casa de las Bugambilias gets top marks from guests and magazines alike for its small charms and gorgeous bedrooms. Having spent nearly six months in Oaxaca, I had plenty of time to visit the nearby towns and take the most common daytrips. 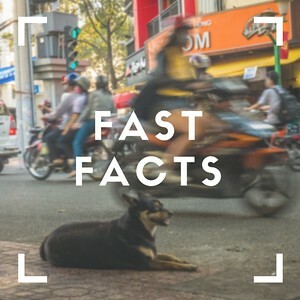 As a volunteer for a microfinance organization, I also spent more time than most tourists in a few of these places, so you’ll find café recommendations and additional details wherever I have them. There are a ton of day trips in every direction from the city. I found this Oaxaca Mio map is the best visual way to sort the ruins, markets, and artisan towns that you’ll see referenced here, as well as in any other research you conduct. All the trips I recommend below are daytrips, but the map shows plenty that are ideal for a weekend or a stopover en route to somewhere else. 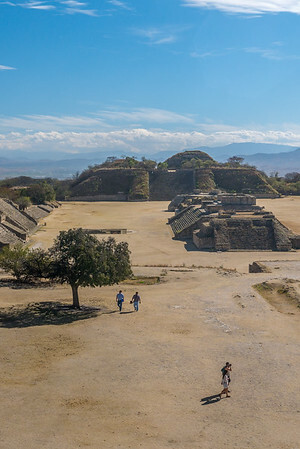 Soaring blue sky and views far into the distance, Monte Alban is a dead-simple day trip from Oaxaca City and highly recommended. This spot was the most important Zapotec site for more than a thousand years. It dates back to 500 BC. The pyramids had similarities (the ball court) and differences (round columns) from the Maya pyramids you find in the Yucatán and in Guatemala. This was the political center of Zapotec society, with the nearby Mitla ruins providing the religious center. The easiest option is to take a bus from Oaxaca Center, just west of the zócolo. Buses leave regularly throughout the day and for less than $5 it buys you a round-trip ticket. The ticket agent will explain when the buses return and you simply hand the driver your second ticket. It’s a quick 20 minute bus ride out town (a bit longer if you’re leaving during rush hour) and up into the nearby mountains. Plan on at least an hour and a half to tour the ruins and the on-site museum. Bring a guidebook or download the information on your phone beforehand as the information and signage is thin throughout the site. 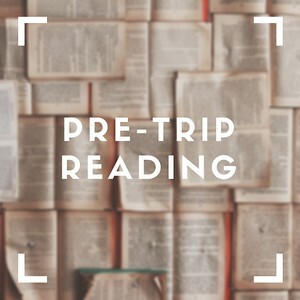 Round trip, the entire experience will take you a few hours. One of the prettiest daytrips outside of Oaxaca City. The name translates to “the water boils” in Spanish and it’s a calcified waterfall that rains down the side of a mountain. There are also gorgeous pools of icy-blue water and a few gorgeous viewpoints above it all. Small springs feed the pools of water, which is full of calcium carbonate and minerals, causing cool, variegated pools of green and turquoise. It’s all swimmable and it’s a little like a nature-made infinity pool with views over the mountains. This is 1.5 hours outside of Oaxaca and you have three options to get there. Take a day tour, take a colectivo, or rent a private taxi. I went with a group of friends and we used a fantastic driver named Ivan, who took us out to the ruins and also stopped at a couple other sites on the way back into town. 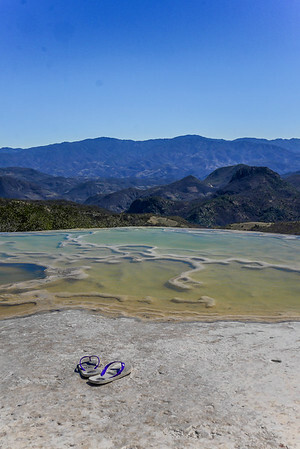 Jodi’s thorough post on Hierve el Agua shares the history and what to expect, as well as more specifics on how to get there (and she can give you information on our trusted driver). This Montezuma Cyprus is the stoutest tree in the world. It measures in at a whopping 137.8 ft circumference. The Árbol del Tule is located just outside of Oaxaca City and sits in a quiet church courtyard, which is an ancient sacred site. 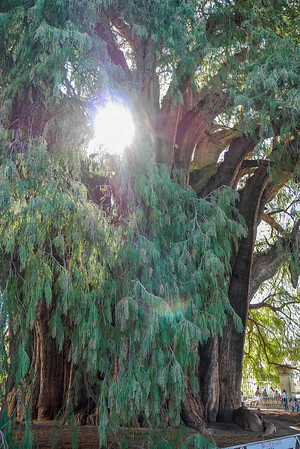 Local Zapotec legend dates the tree to about 1,400 years old, but estimates vary and some date it to 3,000 years even. Sadly, as this area grows the tree has begun to show signs of dying. Pollution, traffic, and water shortages have caused the tree to show signs of stress. It’s sad to think after several millennia that this site might be felled by inadvertent human influence. 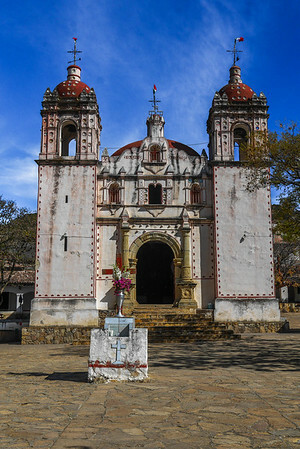 Santa Maria del Tule, the town holding the tree, is very close to Oaxaca centro and it’s affordable to take a taxi there, or easy to visit via colectivo, too. Head to the colectivo spot in the northeast of Oaxaca and then wait for a colectivo to pass that has “Santa Maria del Tule” on the side. You can also catch one from Abastos market if that is closer to your accommodation. These colectivos, shared taxi, leave when full. If it sets out partially full then it will stop along the way and pick up other passengers, but it will eventually drop you near the Tule tree before turning around and heading back to Oaxaca City. The entrance fee is nominal and the tiny restaurants nearby offer cool drinks and either quesadilla or empanadas. Teotitlán is another easy day trip and the best place to go if you’re keen to buy a tapete, the gorgeous hand-woven rugs you see all over town. This town has a long history of weaving and you won’t lack for options. The majority of the population is Zapotec and they speak this as their first language, although all the vendors will speak to you in Spanish (don’t count on much English). There is a great coffee shop in the town center, Dulizun—tasty coffee, free Wi-Fi, and they can often whip up a vegetarian tlayuda on request. But if you’re hungry, head to Artesanías Jaguar Cafe, which is a better bet for a filling meal. Isabel will easily handle your request for interesting vegetarian food, and she also serves delicious meat dishes if that’s your thing. The women running both of these establishments are En Vía borrowers from the microfinance program I volunteered with while I lived in Oaxaca. If you’re in town during the morning hours, the covered market in town bustles with activity and always makes for an affordable breakfast. Prices on textiles are slightly more competitive than anywhere in Oaxaca Centro since you’re closer to the source and rents are lower. Take a colectivo to the town (about 20 pesos and leaves from northeast colectivo spot. Instructions on catching a colectivo are in the transportation section above) and it drops you on the main road in town, it’s just a two-minute walk to the church (orient yourself by looking for the large church towers, or look for the signs pointing to Mercado de Artesanías) and as you walk toward the church you are in the heart of town. The bus drops you at the crucero and you will take a colectivo five minutes into town. Once there, you’ll see countless small shops selling rugs, textiles, and various souvenirs. Bargain respectfully if you’re buying anything. Colectivos leave from that same main road and nearly all of them head directly to Oaxaca Centro. If you are having a hard time finding a ride back or if you’re in a hurry, take one of the tiny mototaxis to the “crucero,” which is the highway crossing, and flag down a passing colectivo. To get dropped near the same spot you left, tell the driver “estadio de béisbol” and “la prepa“. They will understand you want to return to the northeast corner of town. If you’re keen to see additional ruins, Mitla is less popular than Monte Albán, but a beautiful set of ruins with many parts restored to resemble what it might have looked like in the heyday. The ruins date back to about the 1520s, but the inhabitants date back as far as 100 CE, and maybe even further, to 900 BCE according to some estimates. This was the religious heart of the Zapotec civilization in the area before the Spanish arrived. Intricate geometric patterns cover the ruins, and it’s these patterns that you see replicated in the textiles in this part of Mexico. The locals pull inspiration from their artisanal history passed on throughout generations and echoed in the geometric patterns still visible on the ruins at Mitla. 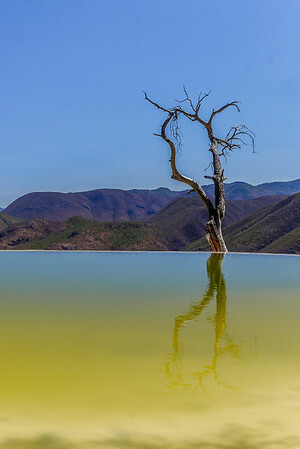 The site is located 45km southeast of Oaxaca, and perhaps easiest to visit combined with the trip to Hierve el Agua if you are renting a car. You could also catch a colectivo or bus from Abastos market or the northeast colectivo spot, you may not get a direct one, in which case you will change at Tlacolula. If you’re visiting Oaxaca for several days, this makes for another interesting day-trip. It’s one of the ones I kick myself for not visiting while I was living there. Once known for manufacturing cochineal, which is still an important dye for indigenous crafts, the monastery is set on a hillside and is gorgeous by all accounts. You can catch a colectivo from Abastos, or take a taxi since it’s just 12km outside of the city center.